Domenic is a highly motivated, passionate and competitive professional with a wealth of experience and knowledge in real estate, marketing and technology. With many accolades to his name, Domenic is a Licensed Real Estate Agent & Auctioneer, A member of the Australian Institute of Company Directors, winner of the 2001 Young Entrepreneur of the year award, finalist for the Young Australian of the year award in 2004 and winner of the 2004 Nescafe` big break award. Domenic prides himself on his professionalism, etiquette and honesty. "......being able to relate to people and understand their needs and wants is what motivates me". 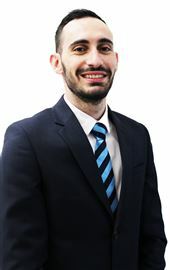 Adrian commenced his career in real estate in 2008 and has achieved many accolades during this period. Real estate is not just a career for Adrian, but a passion. Residing in South West Sydney his whole life, Adrian knows what will attract prospective buyers to your property and what marketing tools will be required to achieve the maximum sale price for your property. Working with the team at Harcourts Paramount Adrian looks forward to helping you with your next property transaction. Lana is an enthusiastic, committed and professional sales associate with a difference. Having grown up in the South West, she has a profound connection to and appreciation for selling property within the local area, which comes naturally to Lana and also provides her with an intimate knowledge of the local property market. Lana prides herself on being a motivated fundraiser and supporter of the make a wish foundation. Sold In Just 4 Weeks!! House Of The Week ! SOLD SOLD prior to Auction!! SOLD in only 3 days !! SOLD in only 7 days ! !